Palisade - a means of defense, to surround, enclose, to fortify. Some might call it fate, but from the beginning it was clear that it was God's divine plan for Palisade to come into being. He handpicked the members (Ashley Jett, Jeremy Noel, and Brandon Peffer) from their individual walks of life and brought them together. Since 1999, Palisade has traveled across the country with a passion for spreading the Gospel through music.Their music is a blend of acoustic pop and powerful ballads marked by tight harmonies and outstanding solos. With two albums of original material under their belt, Palisade has gained strong attention and support from the Christian music industry. These relationships have contributed to their career, enabling them to share the stage with artists such as The Swift, Imperials, & Clay Crosse. 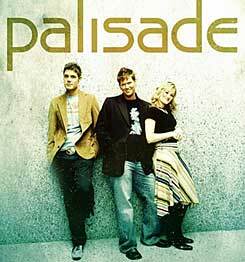 In March 30, 2004- Fervent Records, label home to Big Daddy Weave, Barlow Girl, By The Tree, and Jill Phillips, is proud to announce the signing of new modern pop group, Palisade, to its roster. "We are very excited to have Palisade as part of the Fervent family," says Susan Riley, owner and president of Fervent Records. "Jeremy, Brandon, and Ashley are extremely talented, and they have a genuine passion for spreading the Gospel through their music. We look forward to standing beside them and taking them to the next level in their ministry." Recently signing to GOA, Inc. for booking, the group's self-titled label debut, which releases July 20, was produced by Jeromy Deibler of FFH and features songs written by Palisade, Deibler, and other acclaimed writers including Mark Schultz, Scott Krippayne, and Tony Wood. "Working with Palisade has been like a breath of fresh air," says Deibler, who has become a mentor to the group. "The path their career has taken is strangely similar to the path FFH took seven years ago, and I am honored and excited to have been apart of this turning point in their ministry." Each growing up as pastors' kids- Ashley Jett, Jeremy Noel and Brandon Peffer all knew at an early age that they were destined to spread the gospel through their music. Jeremy and Brandon first met on the campus of Kentucky Christian College, quickly discovering their shared love of music and ministry. The two young men decided that they needed a female vocalist and subsequently placed an ad on a Christian website, which is how they met Ashley. They knew right away that their voices blended together in a very special way. Together for four years, Palisade has produced two independent projects and has toured an average of 125 dates per year. The trio's mission of allowing God to use them to touch people with the message of Christ is demonstrated by the sincerity of heart that is evident from the moment you meet them.